Alexander Joseph "Alex" Killorn (born September 14, 1989) is a Canadian professional ice hockey centre currently playing for the Tampa Bay Lightning of the National Hockey League (NHL). He was selected by the Lightning in the third round, 77th overall, of the 2007 NHL Entry Draft. Although born in Halifax, Nova Scotia, he grew up in Beaconsfield, Quebec, attending Loyola High School in Montreal and playing Lakeshore minor hockey. He played midget AAA hockey for the Lac St. Louis Lions before attending Deerfield Academy in Deerfield, MA where he graduated in 2008. 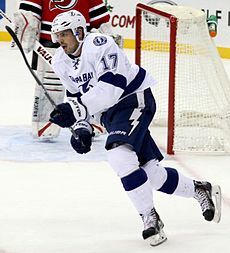 Killorn was selected by the Tampa Bay Lightning in the 2007 NHL Entry Draft in the third round, 77th overall, during the summer before his senior year at Deerfield. He then played collegiate hockey in the United States with Harvard University in the a NCAA Men's Division I ECAC Hockey conference. In his senior year, Killorn's outstanding play was recognized when he was selected to the 2011–12 ECAC Hockey First Team. On May 19, 2012, Killorn signed a two-year, entry-level contract with the Tampa Bay Lightning after completing his playing career with the Harvard Crimson men's ice hockey team. On February 10, 2013, he recorded his first career NHL assist on a goal scored by Vincent Lecavalier, against the New York Rangers. One week later, on February 17, 2013, Killorn scored his first goal against the Florida Panthers. On June 19, 2014, the Lightning announced that they had re-signed Killorn to a two-year contract extension. During the 2015 Stanley Cup playoffs Killorn had a successful post season run with the Tampa Bay Lightning, helping them reach the Stanley Cup Final against the Chicago Blackhawks. The Lightning ended up falling to the Blackhawks in six games. Despite the loss, Killorn had a strong post season for the team, and also posted several records for former players from Harvard. Killorn's game one goal was the first goal scored by a Harvard alum in a Stanley Cup final. Killorn added a second goal in game five to become the first alum with multiple goals or assists in the final. His 2015 postseason scoring totals (9 goals, 9 assists, 18 points) are all single-post season records among the twelve Harvard alumni who have played in the NHL postseason. Killorn's 10 goals over two post seasons is second only to Dominic Moore (11 goals) on the Harvard all-time list, which was achieved in only 30 playoff games to Moore's 88. On October 12, 2015, Killorn recorded his 100th career NHL point in a 6-3 Lightning win over the Boston Bruins. On October 27, 2015, Killorn skated in his 200th career NHL game in a 0-2 Lightning loss to the St. Louis Blues. On July 17, 2016, Killorn signed a seven-year, $31 million extension with the Lightning. Last season Killorn appeared in 81 games with the team, recording 14 goals and 40 points. Killorn also skated in 17 Stanley Cup Playoff games last year, where he scored five goals and 13 points. Killorn has spent his entire NHL career with the Lightning, scoring 53 goals and 138 points. Killorn's biggest impact has come during the playoffs, where he has recorded 33 points in 47 games. On November 3, 2017, the NHL Department of Player Safety fined Killorn $5,000 for an incident that occurred during a game against the New York Rangers the previous night at Amalie Arena. On February 19, 2019, Killorn recorded his 100th career NHL goal in a 5-2 Lightning victory over the Philadelphia Flyers at Wells Fargo Center. Killorn recorded his first career NHL hat-trick against the Washington Capitals on March 16, 2019. On April 19, 2017, Killorn was named to Canada's men's national ice hockey team for the 2017 IIHF World Championship. On May 21, 2017, Killorn earned a silver medal with Team Canada when they were defeated by Team Sweden 2-1. Killorn's college hockey career is mentioned in the bestselling book Odd Man Rush: A Harvard Kid's Hockey Odyssey from Central Park to Somewhere in Sweden—with Stops along the Way by Bill Keenan. Keenan and Killorn were teammates at Harvard. ^ "Men's Hockey Players Earn ECAC Awards". Harvard Crimson. March 17, 2012. Retrieved March 17, 2012. ^ "Alex Killorn: The road less traveled". NHL.com. ^ "Lightning re-sign Alex Killorn". NHL.com. ^ "Blackhawks claim third Stanley Cup in six seasons with shutout of Lightning – Recap". ESPN. June 16, 2015. Retrieved June 19, 2015. ^ Ledecky, Michael (June 19, 2015). "Alex Killorn Makes Harvard History with Finals Rune". The Back Page, the official sports blog of the Harvard Crimson. Retrieved June 22, 2015. ^ Kalman, Matt (October 12, 2015). "Stamkos earns 500th point in Lightning's win at Bruins". NHL.com. Retrieved October 12, 2015. ^ Korac, Louie (October 27, 2015). "Gomez scores; Allen, Blues shut out Lightning". NHL.com. Retrieved October 29, 2015. ^ @NHLPlayerSafety (November 3, 2017). "Killorn fined $5,000 for unsportsmanlike conduct in game against New York Rangers" (Tweet) – via Twitter. ^ @TBLightning (February 19, 2019). "Congrats on 100, Alex Killorn!!" (Tweet) – via Twitter. ^ "Miller leads Lightning past Flyers for seventh straight win". usatoday.com. February 19, 2019. Retrieved February 19, 2019. ^ "Alex Killorn powers Lightning past Capitals". tampabay.com. February 16, 2019. Retrieved March 17, 2019. ^ "Hockey Canada Confirms First 18 Players on Worlds' Roster". hockeycanada.ca. Hockey Canada. April 19, 2017. Retrieved April 19, 2017. ^ "Sweden defeats Canada in shootout to win 2017 IIHF world title". Sportsnet.ca. Sportsnet. May 21, 2017. Retrieved May 22, 2017. ^ "League Announces Regular-Season Awards". March 15, 2012. ^ "All-Tournament Honors" (PDF). ECAC Hockey. Retrieved May 12, 2014. ^ "Norfolk Admirals Official Website". Norfolkadmirals.com. Archived from the original on June 25, 2012. Retrieved May 21, 2015.